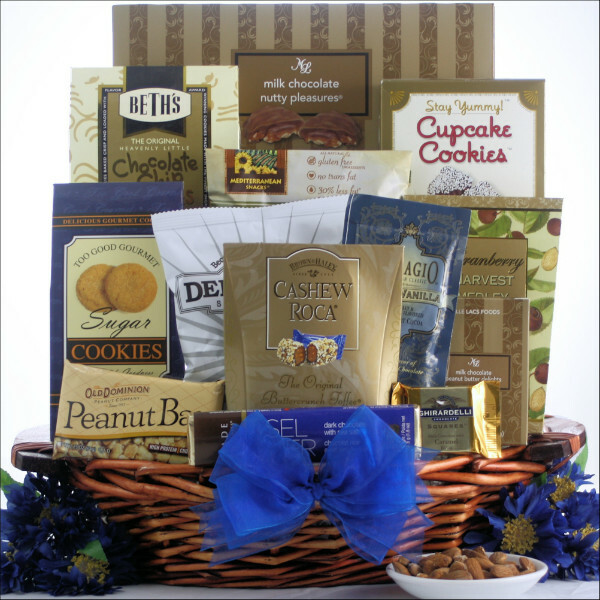 The array of all certified Kosher goodies in this Gourmet Kosher Hanukkah Sweets Gift Basket is designed specifically for the resident sweet tooth on your gift list. Your recipient will enjoy Milk Chocolate Peanut Butter Delights, Ghirardelli Milk Chocolate Caramel Premium Square, Cashew Roca Buttercrunch Candy, Triple Chocolate Cupcake Cookies, Bellagio French Vanilla Gourmet Cocoa and more. This basket is sure to please just about everyone on your gift list, and will last throughout all eight days and nights of this festive holiday.